Save time, money and energy with our free Reiki Business Starter Kit. It includes: professional brochures, client intake forms and 2 hours of Reiki music. Because word of mouth and referrals are a great way to attract your ideal clients, having business cards are helpful. You will want to ensure your business name as well as your personal name are on your card. Then you will want to include relevant contact information. This will include your phone number and website as well as your email address and location if you choose. You may also find it helpful to have a template on the back of the card that allows you to fill out the appointment date and time. By providing your clients with a physical reminder of their next appointment, you also give them a card that they can pass on to those they feel may benefit from working with you. With regard to the image and background of the card, you can choose your logo and if you do not have one, you will want to choose an image and/or colors that resonate with you and your business. If you are skilled with word processing software, there are many templates available that you can use and modify or you can use a low cost option available online. Always have business cards on hand. 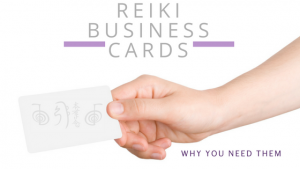 When someone asks what you do, you can provide a simple explanation of Reiki and if they are interested, you can give them your business card and let them know they can learn more by visiting your website if you have one. Be confident and willing to share the amazing and powerful work that you do. You will be surprised at how the clients who will most benefit from your work will find you. Our guided meditation will help you switch off and make the most of your precious quiet moments. Sign up below to get it delivered straight to your inbox (we’ll also send you the latest information about Reiki in your local area). It includes: professional brochures, client intake forms and guided meditation to create your ideal practice.